Vizztone Records has been on a hot streak over the last year, producing many of the best blues albums in the past 12 months. But, man oh man, I never expected this album. Bloodest Saxophone has been around the Tokyo music scene for 20 years, with the ambition "to rule the world with the saxophone." They've got a whole bunch of previous horn-dominated albums, including one with legendary sax player Big Jay McNeely. 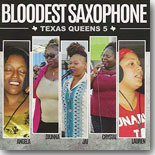 It was Dialtone Record's bossman Eddie Stout who had the brilliant idea of bringing Bloodest Saxophone to Texas and teaming them up with five stellar female blues/soul singers, and the result of this mad scientist experiment is the outstanding Texas Queens 5. Listen to just one cut, and you'll undoubtedly be nodding your head, tapping your feet, and saying, "Wow!" The previous statement is especially relevant if you start from the beginning of the album and don't shuffle the order, because Diunna Greenleaf opens with the calypso-ish "I've Got A Feeling" with some heavy-duty tribal chanting at the start of the cut. Man, this one sounds right out of the 1940s! The five queens then join together on the Muddy Waters classic, "I Just Want To Make Love To You." I never thought I'd enjoy any version of this song that didn't have that classic Little Walter harmonica solo, but these Texas ladies fill that void quite easily. Up next is one of my favorite cuts, a version of "Losing Battle" that was once a New Orleans hit for Deacon John, but here Crystal Thomas makes it her own with tortured vocals on a slow blues. She's having fun fighting that losing battle, as she sings, ".... I'm having so much fun trying to win ..." The outstanding singer Jai Malano jumps in next with a rockin' version of Rufus Thomas' "Walking The Dog." Bloodest Saxophone guitarist Shuji (aka "Apple Juice") throws down some red hot guitar licks on this one. A couple of regular Texas cats --- sax player Kaz Kazanoff and guitarist Johnny Moeller --- join the party on the wild, wild instrumental "Pork Chop Chick." This number truly has a wall of horns blowing away while Moeller contributes tasty guitar. Lauren Cervantes gets her first chance to step to the front of the stage on the Louis Jordan calypso classic, "Run Joe," and she kills it. Mr. Jordan would be smiling if he heard this version. One of my favorite albums from 2017 was Samantha Fish's Chills & Fever which contained her excellent cover of Charles Sheffield's "It's Your Voodoo Working." Malano's powerful vocals on this snaky blues puts her version right onto the top shelf with Ms. Fish's cover. Thomas returns with the rollicking blues "Don't Move Me," a Roscoe Robinson original. "Don't Hit Me No More" was done originally in 1967 by Mable John for Stax Records, but it would be even more appropriate today as part of the #MeToo movement. Angela Miller takes the lead of this slow blues on which she sings, "... If you hit me, be ready to quit me ..." and "... Talk to me with your mouth, and not with your hand ..." Malano returns with the jump blues "I Done Done It," with call-and-response between both the horns and the singers. One of the most stirring numbers here is Cervantes' take on a novelty drinking song, "The Grape Vine," about how much she likes that wine, singing, "... Just plant a grapevine over my grave, and let the juice drip through ..." There's a incendiary sax solo or two mixed in here (but, really, I could say that about every cut on this album, because that's what Bloodest Saxophone was born to do). We close with another instrumental, the slow to medium blues shuffle "Coackroach Run." Koda "Young Corn" Shintaro tears it up on tenor sax while we hear some jangly guitar from either Moeller or Shuji. A nice way to end a red hot blues album. I'll say it again --- Eddie Stout made a genius move in teaming up these cats from Japan with this group of Texas blues singers. More, please.